At the upcoming edition of Colombiatex, Colombia’s major textiles trade fair, to be held in Medellin from 22-24 January 2019, Italy’s primary textile machinery manufacturers will be on hand in the common area jointly set up by the Italian Trade Agency and ACIMIT, the Association of Italian Textile Machinery Manufacturers. 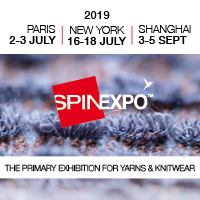 There will be fifteen Italian textileS companies exhibiting in this common space, all ACIMIT associated members: Arioli, Beschi, Biancalani, Btsr, Caipo, Corino, Crosta, Fadis, Ferraro, Itema, Mcs, Ratti, Sicam, Tecnorama and Ugolini. Colombia’s textiles and garments industry has seen a strong period of growth over the past few years, thanks to the signing of a number of international trade agreements and its developing fashion sector. Colombian textiles manufacturers have thus been long time partners of Italian textile technology suppliers. The development of the local textile and garments industry needs a technological upgrading, entailing an increase in demand for foreign machinery. Italy has benefitted from this growing demand, in its dominant position as one of the world’s major producers of textile machinery. Indeed, Italian exports to Colombia in 2017 amounted to EUR 10 million, and over the first seven months of 2018, sales of Italian textile machinery to Colombia exceeded EUR 4 million. “The ongoing presence of Italian machinery producers at recent editions of Colombiatex, confirms the willingness of Colombia’s textile sector to continue a growth process that also requires high quality technology, such as Italian machinery manufacturers are capable of providing,” commented ACIMIT president Alessandro Zucchi. ACIMIT represents an industrial sector that comprises around 300 companies employing around 12,000 people, manufacturing machinery for an overall value of about EUR 2.5 billion, of which fully 84% is exported.